Why? Why re-make a dystopian science fiction series originally transmitted in 1975 now only remembered by audiences of a certain age? Well, you can apply the same question to most re-makes, I expect. Indeed, what prompted the resurrection of a certain Time Lord four years ago. First and foremost, the original must have been good, in fact, so good that the BBC went after the rights to make it. Yes, the original 38 episodes are good. Then, the themes and issues must still be relevant. Of course, bird flu, anyone? Survivors is rightly enshrined within the British SF dystopian tradition but its themes have since been revisited by a number of films and television, such as The Last Train, 28 Days Later, even the recent Dead Set. So, the main concern is whether 'creator and writer' Adrian Hodges (I would argue that he isn't strictly the 'creator' of Survivors, because the last time I checked Terry Nation was) can recreate the characters and iconic moments of the original and make the story relevant for a modern audience. Graham is far better here than she was in Bonekickers but that may well be down to a half decent script and direction. He sort of succeeds. If you were paying attention to the end titles you'll have noticed that in fact the series is based on the Terry Nation book of Survivors and not the series as such. The book adapts a number of the original first series episodes and then veers off into a completely different story that isn't related to the series at all and that has the survivors of an epidemic buggering off to France. So, is Hodges just going to provide us with a version of the book? It'll be a short series then. OK, enough picking over the intentions. What we do get with this 90 minute opener is a slickly produced and directed thriller. Characters are slowly developed as the narrative weaves their destiny towards a crossing of paths in the last half hour. The main focus is on Julie Graham as Abby Grant, how she survives the virus and then goes on a quest for her son, Peter. Graham is far better here than she was in Bonekickers but that may well be down to a half decent script and direction. The discovery of her dead husband David, which follows the original series' opener, is a distinctly unsettling sequence and Graham captures well the sheer overwhelming bewilderment of one person left isolated in a suburbia that is little more than a charnel house. Hodges has a few surprises up his sleeve; he kills off Jenny (an effortlessly good turn from Freema Agyeman), a character which lasted through all the original 38 episodes, transfering much of the character's function to a new creation, Anya Raczynski and he completely reconfigures Tom Price, a Welsh vagrant in the original, but here a devious killer on the loose from prison. Zoe Tapper puts in an equally good performance as Dr. Raczynski (rather too convenient a profession for one of the main characters to have, I'd venture) and again she underlines the traumatic hopelessness that any survivors of such an epidemic would face. Max Beesley is all oily malevolence as Price and will no doubt manipulate his fellow survivors to his own ends. The only other character to make it into the new series is Greg Preston. In the original, he was an engineer, but here he just seems to be the strong, silent type who reluctantly gets dragged in to Abby's vision of a 'new world'. Paterson Joseph, a very strong contender for the role of the 11th Doctor Who, gives us brooding intensity and dispassionate practicality. If he can capture Greg's brusqueness from the original then he'll have nailed the part. Is Hodges going to spin the story out into some dull and predictable government conspiracy? Where the acting and writing fell down for me was in the relationship between Al Sadiq, a bit of a thankless role for Phillip Rhys, and young Muslim Najid (Chahak Patel). I just didn't buy the set up with Al. A wealthy man about town who sticks around whilst a plague rages on his doorstep? And then strikes up a relationship with a young lad and actually only seems to care about the kind of car he drives down streets littered with decomposing bodies? I can understand it's necessary to have characters like this, who are entirely selfish, to provide a different experience of the virus that collides with the idealism of Abby. But the whole sequence of them playing football on a deserted motorway whilst a godawful pop song plays over it is a severe miscalculation and defuses all the tension of the drama to that point. I'm also not entirely sure about the series vision of the epidemic either. Deserted motorways and roads? Surely, it would be a scene of utter chaos? Traffic jams of the dead, a vista of crashed and abandoned cars and plague ridden bodies would be more likely. Instead, it felt as if someone had had a bit of tidy up and left everything looking rather spotless. 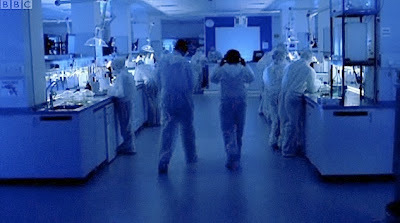 But the worst aspect of this opening episode was that very silly coda with the two white suited laboratory boffins entering some underground bunker that's lit up like a Christmas tree and peopled by other boffins all peering into scientific equipment and no doubt ready to regale us with some clipboard acting. I smell a rat. Is Hodges going to spin the story out into some dull and predictable government conspiracy? Finally, much as I appreciate the effort that director John Alexander put into this - some arresting camera angles - I did feel that this was perhaps too slick and by clearly being so of its time that the glossiness instantly puts a distance between the audience and the subject matter. A grittier approach might have properly put the wind up the average viewer and I was hoping for something more along the lines of the very stark and depressing BBC drama-documentary Smallpox 2002: Silent Weapon. Instead, I hear that Hodges wants to focus on the hope and humanity within the format of the series and doesn't want to make it too grim. Now, that is depressing. The themes of the original were never really science fiction at all and it was a very dark scenario even without today's added concerns over the environment, government and media spin. We suckle ever more at the teat of government and media, comfortably numb in our complacency and selfishness and the story should be about the lack of hope because, let's face it, 30 years after the original Survivors, we're in an even deeper mess than we predicted. Hodges has got his work cut out for him. It's not a bad start and it's entertaining and thought provoking in its own way but it's a comfortable scare and shies away from the true horror of what a city would be like stuffed with rotting bodies, plagues of rats, and hideous diseases. Dead Set, whilst a playful satire on Big Brother and zombie flicks, was much grimmer than this, often deeply unsettling, and that endng with boffins milling about in their underground lab suggests a hope born out of science rather than genuine survival instincts which is far too optimistic and convenient a solution to contemplate for tackling a virus that wipes out 90% of the population. Excellent review Frank. Me, I loved the first two episodes. I actually like the idea of some off piste scientists - I always wanted to know about the how and the why, even when I was a small child creeping into the living room to try and watch my mum's (second) favourite programme (and normally being sent back to bed, sharpish). I also though that Al and the kid were superb - comedy gold. I totally agree with you about the pristine-ness of everything - sure, Greg mentioned cholera and typhus but it hardly seemed realistic given the idyllic surroundings in which he mentioned them. Maybe we'll see more of this in the ocming weeks as it looks as though our team aren't heading for the countryside just yet, more like Lidl. I enjoyed it too. But...I just don't think it went far enough. It shied away too often from what should be a truly awful situation. Yes, I know we got some disturbing sequences but apart from those brief shots of dead bodies in the hospital the most upsetting scene was when Abby was checking the children's bodies in the hostel. That was really grim. In the Radio Times, Hodges made a point of saying that in their tone meetings if they felt something was getting too grim they would junk it. For me, that's the wrong approach completely. The series has to be harsh and uncompromising. It has to be memorable. The original series still is as far as I'm concerned and is up there with The War Game and Threads as great examples of telly that doesn't pull any punches. I agree. More grimness would have been nice, or else what's the point of going out post-watershed? Dead bodies don't just lie around like floppy rag dolls. They liquify. There are maggots and blowflies. Carrion birds pick out the eyes. And Abby goes to a car, pulls the dead woman off the driver's seat, sits down in her place and drives off! NO WAY would I do that. Not in a million years. The dead woman would have been leaking. I thought the portrayal of Al was good. I totally bought that he would spend the apocalypse sitting up in his swanky flat drinking champagne, because he's a selfish so-and-so with the initiative and self-preservation skills of a dead ferret. Even I could have told him that alcohol is NOT an acceptable method of fluid intake. I bet he only left the flat when the leccy went off so he couldn't watch DVDs any more. I'm liking Anya and Tom. Deep waters there. Will Tom revert to type, or is he capable of redemption? Which way will the dark horse Anya jump? Much to think about, and I'll certainly tune in to the next episode. Oh, and when it comes to apocalypse-as-chaos versus apocalypse-as-eerie-emptiness, I think the series decided on the latter because it was cheaper. Well, you put your finger on all of the things that irritated me about the 'apocalypse' in the series. It was way too comfortable. And yeah, probably cheaper to close a few stretches of road rather than fill it with wrecked cars, tons of extras in expensive prosthetics etc etc. I agree about Al. He's a selfish wanker. But even a selfish wanker couldn't be as dim as he is. Tom is certainly going to be the one to watch, The original Tom, played by Talfryn Thomas, was basically a vagrant slacker who got all the other survivors to do everything for him. This eventually lead to an amazing episode 'Law And Order' which went into the whole concept of retaining capital punishment for crimes. I hope they take him down that route in the new series. I think you overestimate the average intelligence of the human race. Al probably Googled 'what to do during an apocalypse', found no answer and couldn't think of anything better to do than eat his way through the remaining food in his flat. Seriously: people CAN be that dim. Tom will be quite useful to the survivors (as long as it is beneficial to him to be so!). You don't lead a life of crime and survive in a prison without possessing a certain amount of brains, courage and low cunning. Murderers can come in handy.